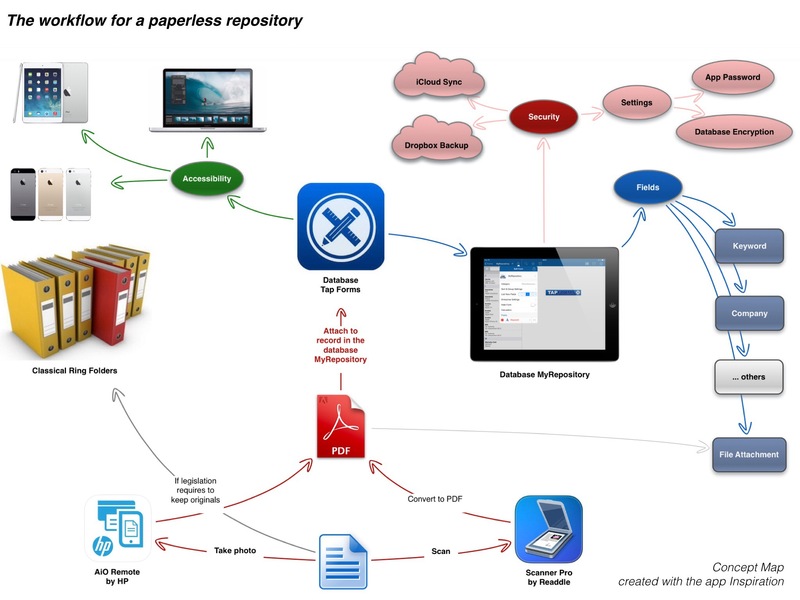 My last blog post was about going paperless with a document keeping app. This post is about a much more powerful solution using a database app. It’s out of question that databases on mobiles are the most efficient way to manage large amount of data. The strong benefit of a database is the synopsis of otherwise widely spread information. Apple’s App Store offers a lot of apps suitable for productive operations but all the informations saved by these apps are cut into pieces saved in app-specific folders. Database management tools summarize all the different types of information in just one app. If you create structured data (e.g. contacts, where every contact consists of a set of fields (e.g. name, email-address, phone number, account, bank) with different contents and save them as a file you have a very simple database. Its just a container in which similar data are stored like in a spreadsheet. An improved version of a database contains many tables, stores your data securely, lets you collaborate simultaneously with other people and gives you fast information about people, stocks, insurances, words in other languages and beyond. But the pure data won’t let you do the jobs. It would be like searching in a very bulky phone book where data are not sorted. So you need database management software (DBMS) to support your curiosity. A Database Management System (DBMS) is a set of algorithms that enables you to store, modify, and extract information from a database, it also provides users with tools to add, delete, access, modify, and analyze data stored in one location. A group can access the data by using query and reporting tools that are part of the DBMS or by using applications specifically written to access the data. A DBMS also provides the method for maintaining the integrity of stored data, running security and users access, and recovering information if the system fails. An powerful feature of databases comes up, if you connect data in different tables. If a record is about a device you might want to attach the receipt and a certificate of warranty. So the first table is about the device itself and the second table contains file attachments e.g. In PDF file format. Records of the two tables are linked together via a common key which could be the serial number of the device. When looking at the main table ‘Devices’ your DBMS retrieves the file attachments from the second table and shows it to you. A database solves many problems with your otherwise widely spread data. Where is the “egg-laying, milk-bearing woolly sow app” that makes it all easy to manage? The short answer is: nowhere except with a database app. 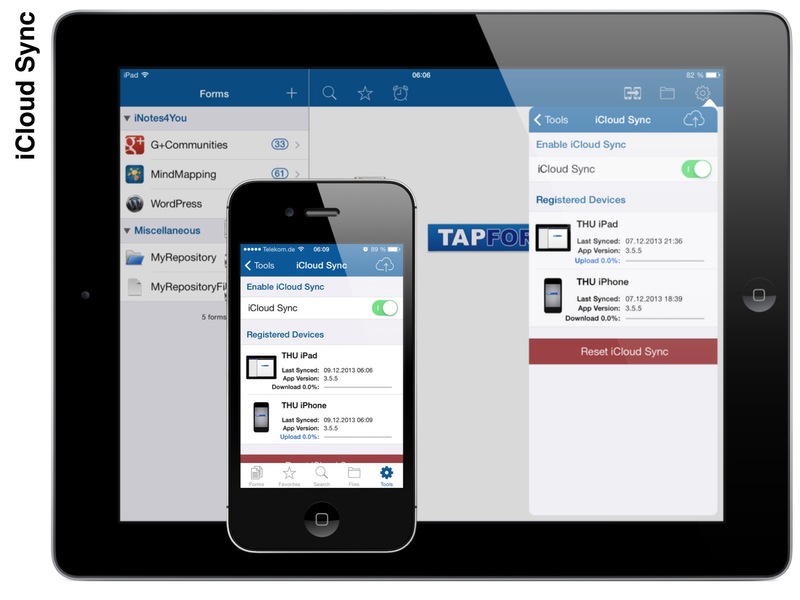 Tap Forms by Tap Zapp Software is by far the best mobile database app for iOS devices and the company offers a desktop companion app which is fully compatible with the iOS version. So there is one and only one data pool accessible from all you Apple devices and syncing via iCloud. Within Tap Forms tables are called ‘forms’. So let us create the form to manage the personal repository. To do so just tap on the ‘+’ icon in the main screen, enter a name for your form and add fields by selecting them from the field list. Enter names for the fields and, if necessary, edit the field options. Don’t worry, you can add them later and remove fields you don’t need. Use pick lists to choose text from predefined lists. It saves time and prevents from using different terms or different spellings. Use a pick list for the field ‘Keyword’ to quickly find related records with a query. Add the field URL to a record to quickly access the website with further information from within the app. Always add the field ‘Note’ to a form to enter annotations which otherwise don’t fit in any other field. Alerts are shown in the notification center and as a counter on the apps icon e.g. to remind you of an important maturity. An Audio field offers the ability to quickly comment on a record. 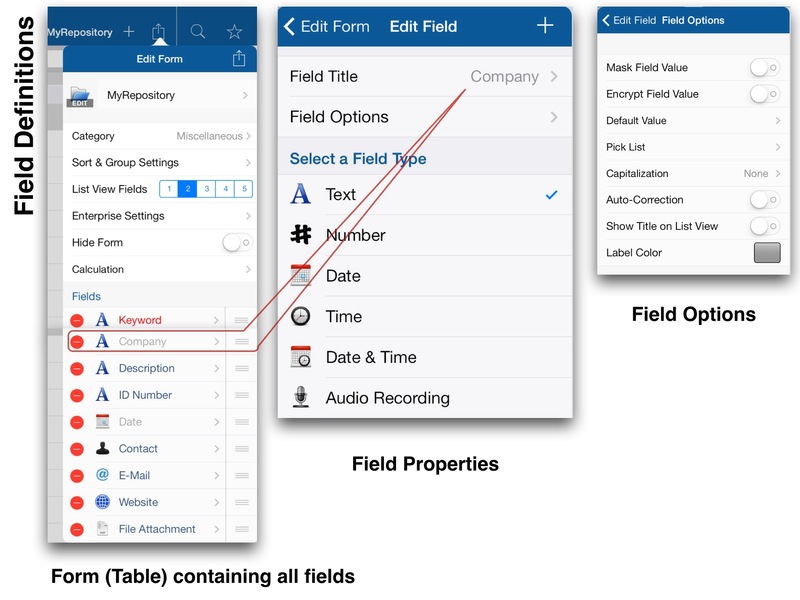 After finishing the field creation procedure you can adjust the layout of the form: rearrange the order of fields, set colors and fonts for labels and values, decide which fields should be shown in the navigation area on the left side of the screen. In my first blog post ‘Go Paperless’ I already mentioned that the PDF file format should be used for scanned documents. So now we have to decide how to attach the files generated by an All-In-One printer with the app AiO Remote by HP or with the help of Scanner Pro by Readdle with which a photo of the document is converted into a PDF file and transferred to Tap Forms. Basically you can add multiple fields of type ‘File Attachment’ to a record so that several documents can be attached to a record. When creating the form you do not know how many files must be attached later. It can be just one or many updates of documents you get from your insurance company over time. So the best solution is to create a second form ‘MyRepositoryFiles’ which contains the files and is linked to the basic form ‘MyRepository’. 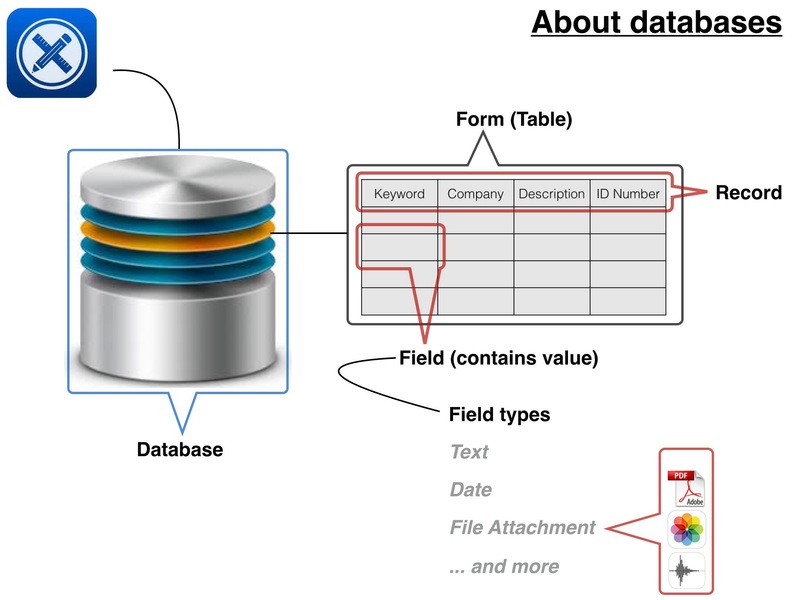 In my example I used both fields, a field of the type ‘File Attachment’ and a field of type ‘Link to Form’ which sets the connection to files in the linked form. Linking a second form to the main form is explained in my article DBMS on iOS devices (2). A personal repository contains sensitive data which should be secured by a password for the app as well as an encryption of the database. Tap Forms then encrypts backups of your database on Dropbox and iCloud with 256-Bit AES algorithms. To update the whole database on all your devices activate iCloud Sync. 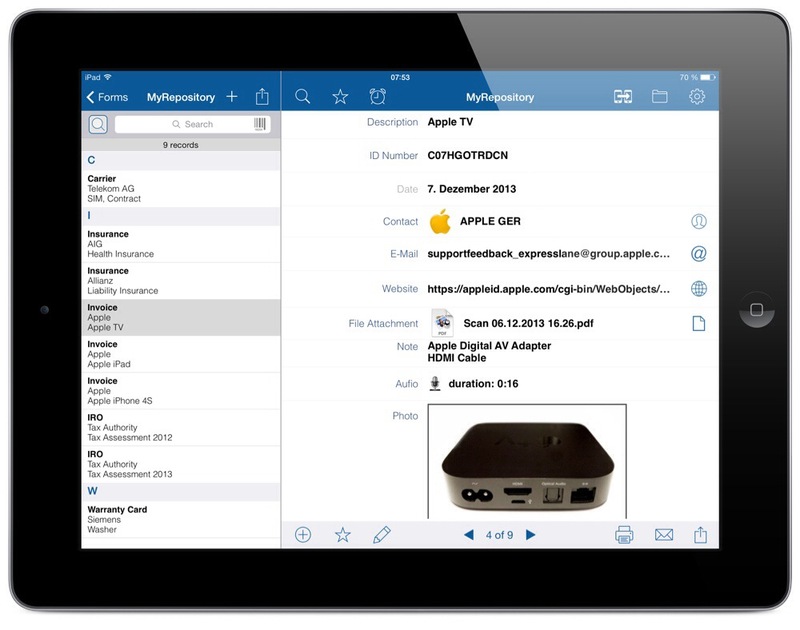 If you use your iPhone for taking a picture of a document or scanning it with the app Scanner Pro by Readdle you usually create a new record, add the document, and want to have it on all other devices when coming home. iCloud Sync does it for you. Because of the relevance of a personal repository it’s indispensable to regularly backup your data on an external storage. With Tap Forms you backup to Dropbox. So there are three copies of your database: on your device, on iCloud, and on Dropbox. This redundancy never let’s you loose your data. Here is the complete workflow visualized in a concept map. In contrast to a document manager like Docunents by Readdle a database is definitely the better choice for managing your personal repository. It adds many useful features not available in pure file managers. To just save PDFs often is not suitable to keep all necessary information together and to complete a record over time with further data e.g. alerts, notes, or files like renewal certificates. Don’t worry about using databases. 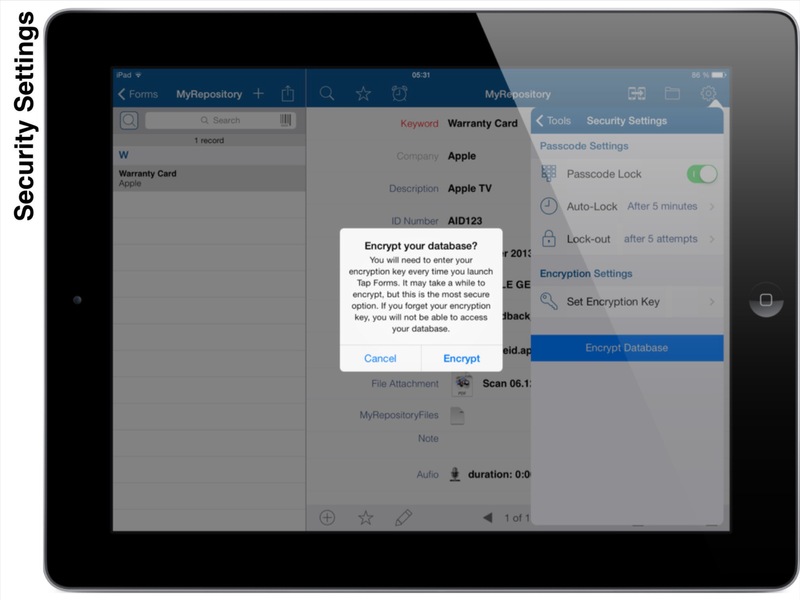 With Tap Forms it’s really easy to build your own ‘application’ for managing secured information in one place with accessibility on all your other Apple devices. Thanks a lot for visiting my blog.